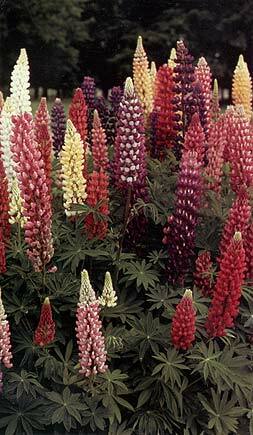 Home|Floral Library|Lupine – Lupinus spp. Supplemental calcium during production can improve vaselife. However, this same calcium may intensify the gravitropic bending of the stems in response to gravity when they are placed horizontal. This member of the Fabaceae or Leguminose (pea or pulse family) has many common relatives including redbud, sweet pea, vetch, pea, wisteria, locust, bean, soybean, coral-tree, clover, silk-tree, mimosa and acacia. Native to many parts of the world depending on species including Western North America, Mediterranean, South America, Southern Europe and North Africa. With many forms, this species is grown for its sometimes fragrant flowers and beautiful foliage. Flowers are arranged in spikes and foliage can sometimes be sticky to the touch. Prefers dry growing areas. In one research report it showed positive effects of 41F storage, wet or dry, if they were STS treated. However, it is believed that lower storage temperatures would be better. In another report, one week storage at 34f reduced subsequent vaselife by about 25-35%. Regarding bare-root stock storage of this species at 29F for 4-6 months, best survival and regrowth results were obtained by those stocks that lost the least amount of water during this period. From Latin “lupus” for wolf, referring to the belief that plants take over the land and thereby exhaust the fertility of the soil. While it is true that many lupine species can spread rapidly, in reality this species can actually add nitrogen to the soil. They do it by taking nitrogen from the air and transforming it into forms that can be used by plants. Most of the commonly cultivated perennial forms were derived mainly from L. polyphyllus and its crosses with L. arboreus and even some annual types. A fine group coming from these crosses is called Russell Hybrids, named after George Russell from New York who introduced them over a 25 year period beginning in 1937. Pollination can hasten flower death. Davis et al. (1995) showed that STS treatment was the best and using flower food did not improve vaselife over that of STS. Storing STS treated flowers at 41F for 3 days did not reduce vaselife compared to non-stored controls.